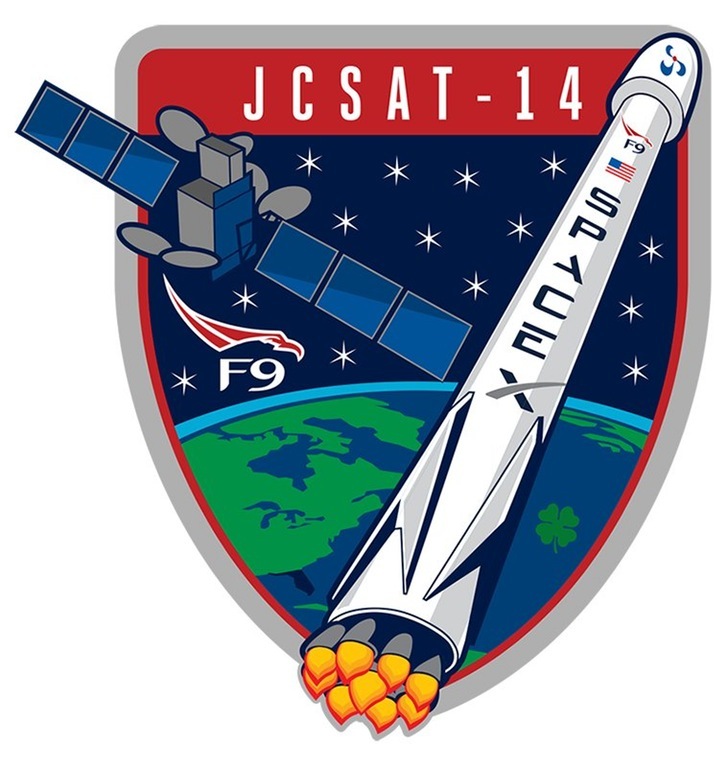 The test involved the Falcon 9 first stage known as S1-024 which flew on May 6 of this year, dispatching the JCSat-14 communications satellite on its way into orbit and successfully completing a high-energy re-entry ahead of a pin-point landing atop SpaceX’s Autonomous Spaceport Drone Ship deployed to the Atlantic Ocean to serve as a mobile landing platform for missions that lack the fuel reserves for a return to shore. S1-024 was the first to master a return from a Geostationary Transfer Orbit mission which have the lowest margin in propellant as the vast majority of the first stage’s performance was required to send the second stage and satellite on the way into a highly elliptical orbit peaking at 35,900 Kilometers. After separation from the second stage, the booster continued on a ballistic arc since no fuel was available for a braking maneuver. 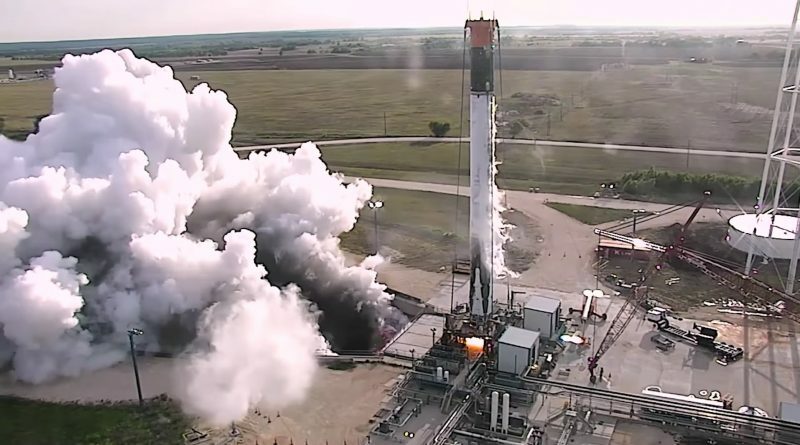 A 15-second re-entry burn with three engines slowed the booster to around 2 Kilometers per second as compared to 1km/s for Low Earth Orbit missions that have the luxury of surplus fuel for braking prior to re-entry. Kinetic energy increases as a square of the velocity and peak heating as a cube of velocity – explaining why boosters coming home after a GTO-delivery show considerable wear and tear compared to those returning after LEO flights. 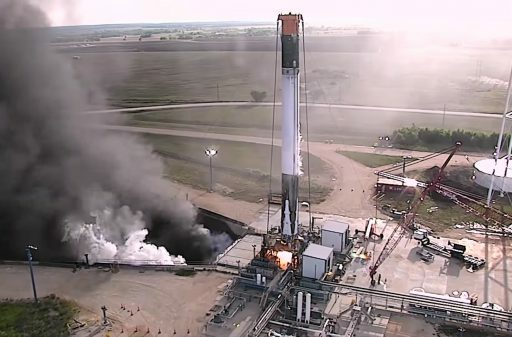 After the very hot re-entry, the booster still had to manage a daring landing on the Drone Ship which used what was previously described as a ‘suicide burn’ – lighting three engines to rapidly slow down for landing instead of the more-controllable single-engine burn available for missions with excess propellant. Hitting the brakes with three engines, the booster rapidly slowed down before the two outer engines were cut for final descent powered by the center engine alone, leading up to a bulls-eye touchdown on the drone ship. Returning to shore four days after its adventurous landing, the booster was offloaded and had its legs removed and all fluids drained before moving to a horizontal position for transfer to SpaceX’s Horizontal Integration Facility at Launch Complex 39A that is being readied for the first flight of the Falcon Heavy rocket later this year. With the capability of holding cores for the assembly of the Heavy, the HIF offered plenty of space for the storage of SpaceX’s returned cores while plans were drawn up for the future of the individual stages. S1-024 joined a pair of Core Stages in the HIF from the successful land landing in December on the second Orbcomm G2 satellite delivery and SpX-8 that mastered the very first Drone Ship landing in April. The cores were later joined by the Thaicom 8 first stage before some departed for their next destinations. 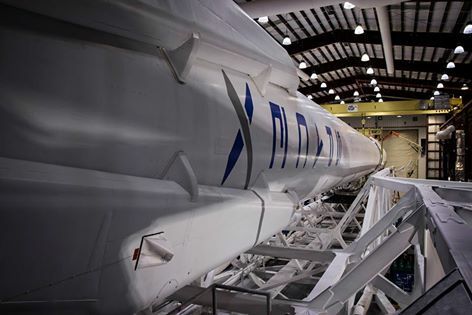 The OG2 core was shipped across the country to be put on display in front of SpaceX headquarters in Hawthorne, California while S1-024 was trucked to the SpaceX test site in McGregor, Texas. It marked the booster’s second stop at McGregor as all first stages go through a full-duration firing test ahead of being shipped to the launch site. 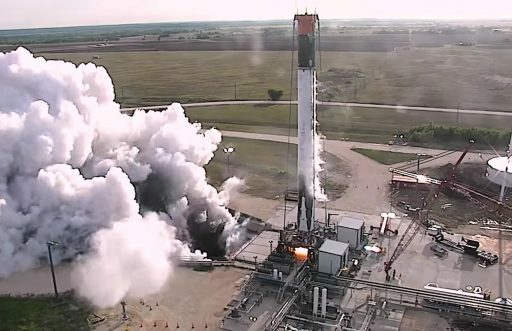 S1-024 was not expected to fly again due to the damage suffered during its particularly hot re-entry, but SpaceX CEO Elon Musk noted that the stage would fulfill a very important part in the company’s quest to the first re-flight, serving as a ground test article for delta-qualification testing – that is certifying the various subsystems of the rocket for re-flight and ensuring all parts could withstand the rigors of going to the edge of space again in an operational mission. 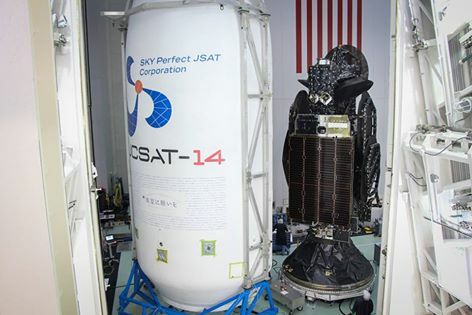 This test program began for S1-024 on Thursday with a full-duration test fire on the S1 test stand at McGregor that had just been vacated by a brand new first stage to ship to Cape Canaveral for the launch of JCSat-16 in the first half of August. SpaceX posted a video on the company’s YouTube channel showing the full-duration firing of 2 minutes and 30 seconds – the normal duration of the first stage’s operation in flight, generating a thrust of up to 694 metric-ton-force and burning 2,450kg of Kerosene and sub-cooled Liquid Oxygen per second. The booster was outfitted with an orange cap, possibly to simulate the weight of the second stage to create a realistic test environment for the structural components of the first stage. This and any subsequent tests of the stage and validations at the component level will deliver crucial data for certifying one of the recovered boosters for re-launch later this year. SpaceX currently has two returned boosters that are in good shape for re-flight – the one from SpX-8 and the SpX-9 booster that recently became the second to complete a return to Landing Zone 1 at Cape Canaveral after sending the Dragon on a cargo flight to the Space Station. The SpX-8 booster will be the first to fly again with liftoff currently penciled in for the September/October time frame. No customer for the mission has been announced to date, but SpaceX reported it had been in talks with an interested party to become the first to fly a re-used Falcon 9. 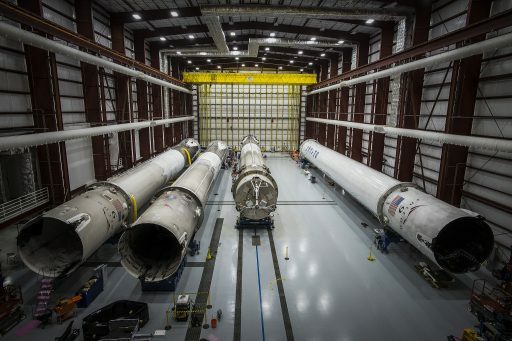 Initially, SpaceX is not planning to offer discounts for used boosters until the process of refurbishing the stages for re-flight can be streamlined. 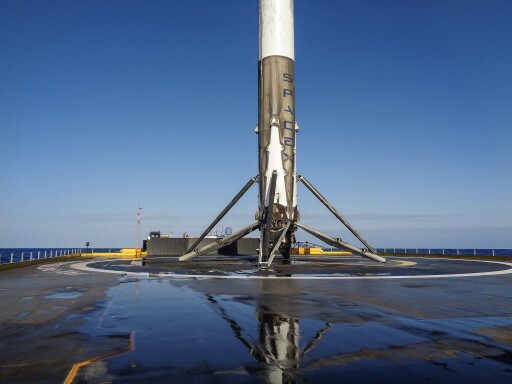 In addition to the re-use of first stages, SpaceX is working on the recovery of Falcon’s payload fairing using stabilization systems for atmospheric descent. The two fairing halves represent two large composite structures that are relatively expensive to manufacture and operational re-use would shave a further few million $ of Falcon’s launch cost. 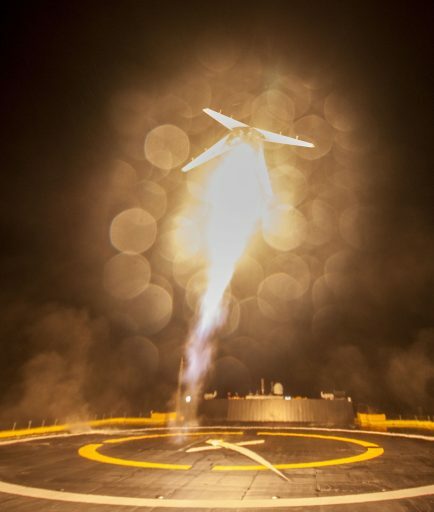 Thursday’s test marked another important step on SpaceX’s path to an initial booster re-flight, though it will take several years for booster landings and re-flights to become routine. Elon Musk expects a number of failures to occur at landing before the return profile for the first stage boosters can be perfected, but the prospects of reducing launch cost by a third or more would give SpaceX a significant edge in the international launch services competition.